‘A Picture is worth a thousand words’ so says the well know English idiom. And this was amply illustrated by Dr Tim Birch, a Director and Head of Living Landscapes at Derbyshire Wildlife Trust, at his recent talk titled ‘A Vision for the Uplands’ where he spoke to 60 members of Buxton Civic Association at their September Members meeting. Tim put a picture on the screen of a chunk of Welsh hillside. The hillside was divided by a fence that ran from the road up to the rocky cliff top. To the left was the usual sheep grazed scene, shorn of all but the shortest grasses, bare, and barren. But on the right hand side, protected as it had been from the sheep, the picture was staggeringly different. The hillside was a riot of small trees, birch, rowan and juniper and blackthorn bushes. Who built the fence? Tim had yet to find out, but the message was clear. Give nature a chance and she will restore and recover damaged landscapes. And once the landscape is restored wildlife will find it and move in. Knepp Estate a 3,500 acre ex arable farm in Sussex is proof of this. Tim had led a team from Derbyshire Wildlife Trust in the early summer to see the pioneering and inspiring work that Charlie Burrell and his wife Isabella Tree have done in wilding their farm. Just two examples illustrate their success, Nightingales have declined by 90% since the 1970’s across Southern England but have found Knepp and are making it a stronghold, the Emperor butterfly is flourishing there and the early morning air is full of bird song. Tim and his team were astonished and moved by the dawn chorus. 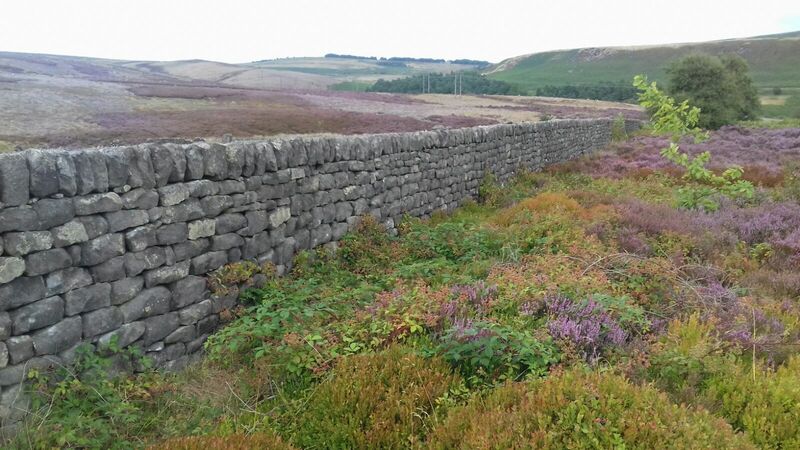 The vision for the uplands is to achieve something similar on a landscape scale for the Peak District. 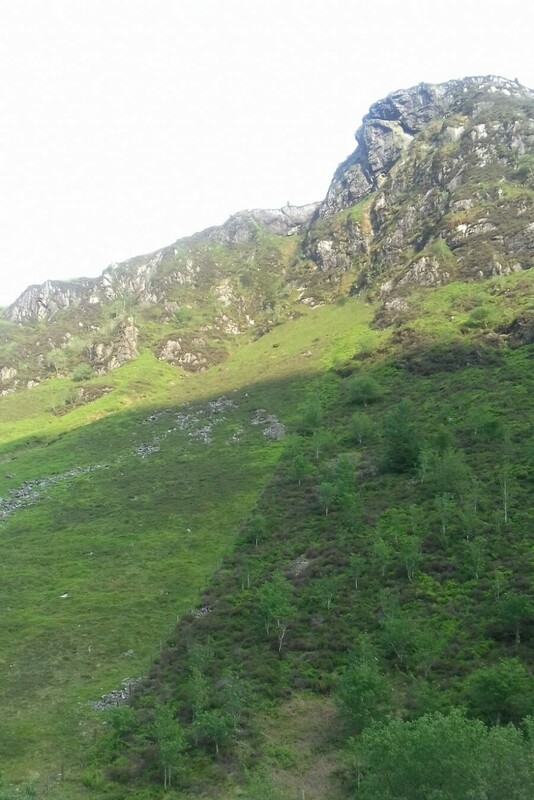 To enable the landscape to recover and heal itself, to encourage once common species such as Pine Marten and red squirrels to return and thrive. And to provide a wonderful place for us, our children and grandchildren to learn about and appreciate the natural world all around us. But to do this, to achieve this vision, will require a landscape scale solution. Tim talked about the isolation of the Derbyshire Wildlife reserves, surrounded as they often are by grouse moors and shooting estates with their traps and snares. The reserves become little refuges for nature but on too small and too fragmented a scale. A good example of this is the Lady Bower Woods Reserve. The picture below illustrates the point. To the left of the stone wall is the Moscar Grouse Moor, to the right the DWT reserve. But create a landscape wide approach and then these reserves become isolated no more, but become vital hot spots of wildlife that can then spread out into the wider landscape. Of course it will all take time. There are a multitude of landowners and stakeholders to consult with and bring on board. But things are changing. Almost daily there is news of new initiatives and schemes, the recent ‘Summit to Shore’ rewilding project in Wales and the plans to restore the Caledonian Forest in Scotland to name but two. And with the drive and vision of Derbyshire Wildlife Trust and all the other wildlife groups including the work that Buxton Civic Association is doing to create woodland habitats that encourage greater biodiversity, then a grand plan for the Peak District will not be far behind. One day soon perhaps there will no need for a fence and we can learn how to let nature survive and thrive alongside us. A Peak District teeming with wildlife, with wildflowers and trees and scrub, where bird song and the hum of insects is taken for granted again, and who knows what might be lurking in the undergrowth or surprise you round the next corner in the forest. That is some vision, and some picture. It is something worth working for.